When we, humans, are with our horses we often become part of the interaction. We are a part of the herd, it doesn’t matter whether we are a horse or not. I see that a herd has an energy field of its own, like a circle, and when we step in that circle we are a part of it. As long as we are inside our rational mind, inside the bubble where we can only hear our thoughts going through our head over and over again, we can be standing next to a horse but not be part of the circle. Inside that bubble communication is impossible. When we are open though, we can become part, even when we are standing outside the pasture. 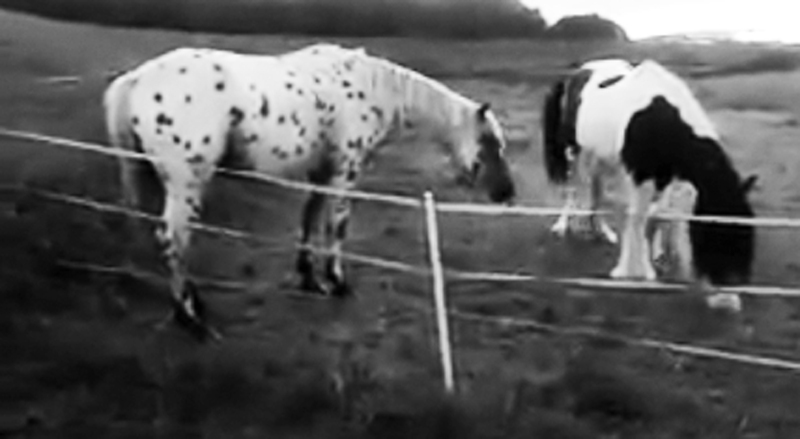 Horses connect beyond fenced areas, physical boundaries don’t limit them in their telepathic and energetic exchange. Though that doesn’t mean that they do not need physical contact with other horses… Communication and connection can be experienced on many levels : body, heart, mind and soul. We need all of these experiences to feel whole. When you are aware and open, you can expand your being intentionally to become part of the herd. By opening your heart to a group of beings, you expand your awareness of self. Your body and the herd’s body merge and you become one being. Horses tap into the energy circle of the herd, this is why horses inside a herd respond to an external trigger as one. When I am totally connected with my herd, and am completely in their circle, I get tired when they get tired and go to sleep when they do. When the whole herd is going to sleep and you are connected, it is almost impossible to stay awake because you get pulled into it. It is a very beautiful experience to feel how you are part of the circle, part of the herd. When we observe horses we can learn to understand them better. When we can see when our horse doesn’t understand us and when he does, we can make changes in our own communication and make ourselves more clear. Open and clear communication gives access to harmony. We should never be angry with our horses, even when they do understand us. There might be another reason why they do not wish to answer our request in the way we would like them to. Always look within and assess yourself: Have I been as clear as I possibly can? Is there some other reason why my horse refuses? Does my horse feel comfortable and relaxed? Is there a hesitation because of something in our environment? Can we then respond to our horse’s request… Because hesitation or refusal of our horse is also communication. It is a question from our horse toward us. Can we respond and continue the dialogue? We can also see how Sindy asks Indezz to back away and how she increases her signals from subtle to more and more obvious. It is very clear that Indezz understands Sindy, but chooses not to give in. This too is very understandable and in no way wrong. He just wants it so much 🙂 He does respond to her signals and that is what communication is about. In essence it is not about the result, but about the way we engage. The way we are able to listen and respond. The dialogue we would like to have with our horse is similar to the one between horses. Our horse and us both have wishes. When we have developed a clear human – horse language can we then take it a step further and engage in the interaction and find alternatives that work for the both of us?